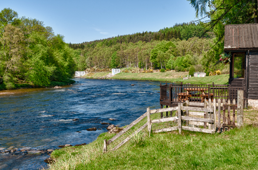 Being on the sunny side of the river and amid lovely scenery, the fishing at Cairnton is both secluded and attractive. The considerable gradient from the top of the beat to the bottom offers a wide variety of pools with great character at both low and high water. Four shelters and two delightful lunch huts are strategically placed along the banks; a well appointed rod room is at the centre of the beat, within reasonable walking distance of all pools. A bank side track gives direct access to all pools, except for a few hundred yards at the extreme ends of the beat, and is passable by most vehicles. There is a resident Ghillie who has a lot of experience in helping both experts and beginners. He comes with a wealth of knowledge in all types of Salmon Fishing.